Do they have toast of the French? Photo courtesy of Michael Lilley. Gastro-pub?? Dunno how that sounds in other parts of the world, but Aussies would avoid it like the plague! We’d assume it was a place where one could get gastroenteritis! So London is not in Britain anymore? Thanks, Brexit! The last time I tried enjoying myself over the lunch of the Italian he kept moving to another table. I once enjoyed myself over the lunch of the Italian… but that’s all in the pasta. 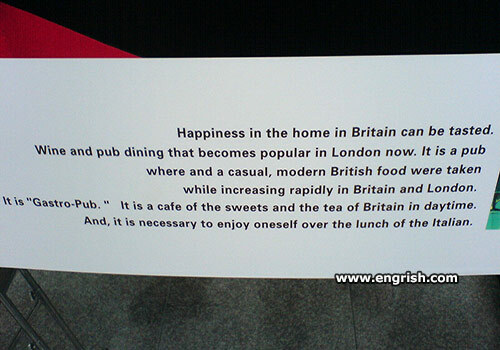 Modern British food, isn´t that a contradiction in itself ? Let us laugh heartily at the misfortune of the starving Italian, ha! He is not London! The Italian was enjoying his lunch until those British yobs barged in. I don’t WANT to eat Spumoni!!!!!!!! @ P C. 1527. More like Curry and Naan Bread. Fish & Ships … & Gondolas. Italian lunch? I thought we were going to London!